You only get one life. Though we all know it’s true, we forget to take it to heart sometimes. That’s why it’s essential that you enjoy the highest quality of life possible. Our Minnetonka Chiropractors Dr. Kelly Sheehan and Dr. Cole Sheehan want to make sure that you can play with your children, work a full day, go for a walk and do everything you love for the rest of your years. We don't treat your body as separate parts. We know that each is connected and look at you as a whole to find the source of your problem. If the trunk of a tree is crooked, the upper branches will never be straight like they should be. Similarly, an issue in your low back might result in neck pain. We want to make sure your spine is in perfect alignment so that you can have the best of health. Our structural form of chiropractic is appropriate for everyone. It is science-based, accurate and creates measurable results. We welcome auto accident injuries, workplace injuries, and accept most insurances. Dr. Kelly founded our office back in 1980. Dr. Cole, his son, joined the team in 2016. Together, they have helped numerous people in our community. You can trust that we'll be honest, provide care with integrity and keep your best interest in mind. With our years of experience, we are sure to find something that can help you. 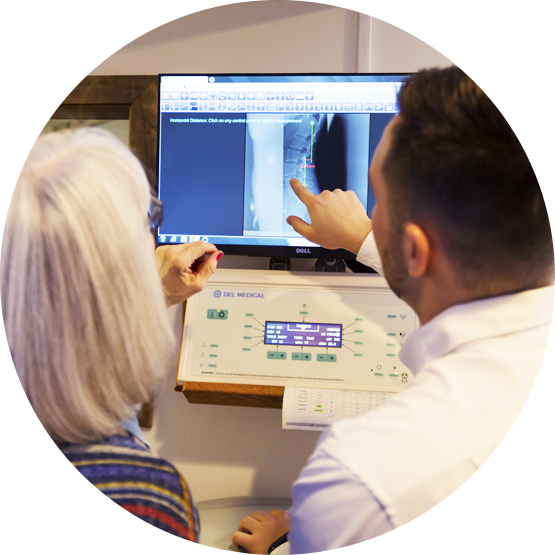 If we think that another practitioner is better suited to your case, we'll be happy to refer you out. If you'd like to find out more, we offer complimentary consultations. Come in, sit down with us and let's discuss your concerns. Contact us today! We have Saturday appointments and late opening hours. Pain is gone! My lower back pain and hip pain is gone. My knee pain has been greatly reduced. And I am no longer having such a problem with muscle spasms. In addition, his comprehensive intake process led to discovery of cervical spine abnormalities that needed to be addressed. With this care, my headaches have decreased. Great focused care and prevention. Thank you, Dr. Cole! I’ve been bringing my 9 month old daughter, to Dr. Sheehan now for 3 weeks. Before she had been receiving his care, her sleep habits were very irregular and for short periods of time. For the last consecutive weeks my daughter has been sleeping 12 hours straight through the night and has been sleeping several long naps throughout the day, something she has never done before. All in all, I have seen a much more content and happy baby since her treatments by Dr. Sheehan. Thank you! Since I started going to Dr. Sheehan I haven’t had ONE headache!! I have quit dragging my left foot, walking and my energy level has gone through the roof! Now when I get off work instead of being a “couch potato” I actually have the energy to do things! The headaches and hip pain have been gone since my first adjustment! Dr. Sheehan is a GODSEND! I never realized that a spine out of whack could cause so many effects. I can’t say enough about how much Dr. Cole has helped me get back to normal! I was in such discomfort with a diagnosed herniated disk in my neck. An orthopedic doctor I saw suggested neck surgery. Fortunately I heard about the docs at Family Health Trust Chiropractic (I was referred by a friend) and life has been better ever since! No surgery needed for THIS neck! Thanks Dr. Cole! I found Kelly in 1989, after turning down Surgery offers and 3 other chiropractors, what a blessing. Kelly told me the facts, herniated disc ok but when will I be back to normal. He said it depends on you. I followed the Doc’s orders and well… I regularly visit for a tune up, just like my oil changes every 3,000- 5,000 miles. Kelly even connected me with the right chiropractor when on a trip when I over did it. Now it is 2017 and looking forward to a tune up on Saturday morning my typical available time. Saturdays wow now that is sweet. Like I said best of the BEST! The back pain is gone. I no longer take Aleve. I have resumed my normal workout and exercise programs without pain. The congestion and cough in my chest is gone. The numb feeling in my face is gone. There are mornings when it is somewhat numb, but when I am up and active for a few hours it appears to clear up. I am still struggling with dizzy spells, a post nasal drip and now and then tightness and pain in my upper back.